So, we survived the first month of 2018 – cheers boss babes! I hope that January was a great start to what’s to come in 2018 for you. Around this time of the year, I like to freshen up and cleanup my social media platforms before the busy months of real estate take over my life. It’s nice to switch up your social media profile photos and update your bios so that you are always current. But it can also be because you’ve recently changed directions in your career or perhaps you have a new business idea to promote through your website. Whatever the reason, taking the time out to polish up your social media can be a way of reminding people that you still exist and possibly reconnect with lost leads. 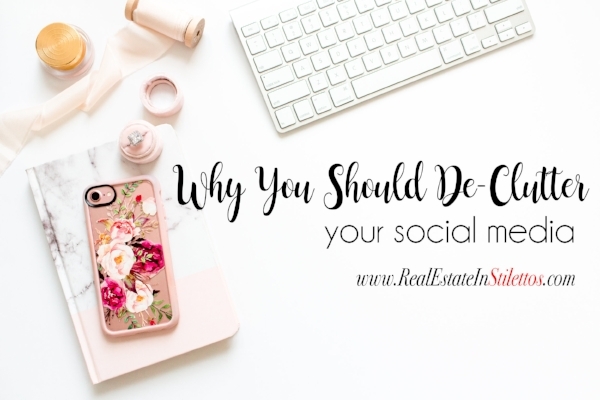 So, as tedious and exhausting as it may feel, I’ve created a mini checklist for you to start the de-cluttering process for each of the frequently used social media platform. If converting to a branded account, delete super personal photos and ensure our profile is adequate for the business you are promoting. Whether you use certain filters or not, decide on just ONE filter to stick to for at least the first nine or so photos. You won’t really know if you like it until you see how it looks visually. If your grid is looking cluttered and you want something clean, delete the photos disrupting your style. Don’t over think it! If you agonize over the feed, you won’t leave room for experimenting or taking risks and it might hinder your creativity. Still, keep the overall look in mind. Visit your followers and see if you missed anyone you’d like to follow back and connect with. Reconnect with the people you do follow and see if what you are posting resonates with their interests as you want your feed to be a place you would like for them to scroll through. Stay ahead of your post cycle and don’t post a photo just for the sake of posting a photo. I like to prepare my posts in advance so I don’t have to post something I am not happy about. Check your DM folder – the message requests are easy to miss and they could be a potential client or someone wanting to hire you for your services! Look at the photo grid that shows your recent uploads and delete anything you no longer wish to have people see on your feed. Scroll through your following and make sure you are not missing out on any really great accounts or follow back the people that are supporting you consistently. Check your messages and favorites to follow up on anything you want to save. If you’re pushing content from Facebook or Instagram directly to twitter, make sure you have content that breaks it up. Otherwise, there’s no point in having this social media channel. Prepare some content in advance to make your profile more robust. Delete photos and updates that no longer represent you (or if a page, your brand). Make sure all your website links on the home page/near the top are valid. Pages – check your admins and permissions to make sure it’s what you want. Personal – check your privacy settings. Check messages and requests you may have missed. Update your bio and your profile photos. I like to keep a consistent photo throughout all of my platforms, but sometimes that can tend to be difficult. Update the e-mail recovery info associated with your account. Change passwords if it’s been awhile. This should be on your list a few times throughout the year, not just at the beginning. I tend to go through my social media platforms every other month to ensure nothing is being left looking sloppy or unprofessional. Hope this was of help to you to give you a basic idea on what you should be doing to keep your social media top notch!